Can Microsoft make OneDrive its very own YouTube? Will OneDrive give Microsoft an online centre of gravity? Amazon banning the sale of Google's Chromecast dongle (along with Apple TV products) doesn't change the fact that YouTube is the default service that everyone – from video bloggers to Microsoft itself – uses to put videos online, with billions of videos watched very month. YouTube isn't just a video site – it underpins multiple video and movie ecosystems. Microsoft is hoping for that kind of ubiquity for its OneDrive cloud storage service. And with all of us using more and more devices, often with far less storage than a desktop PC, OneDrive could become the place for all things data – if Microsoft can persuade users and developers to turn to it, that is. Between apps, tablets, smartphones and social media, syncing and sharing have become key features – they're what you're most likely to do with files, because we want access to our files wherever we are, on whatever device we're using. Smartphones make it easy to take more photos than you can fit on your phone – and when we get a new phone, we want it to pick up our photos, music and address book automatically. Getting at our files has to work everywhere, which means you need a cloud service. But just because cloud storage is becoming common doesn't mean you can make money offering it. Never mind the 5-15GB you can get for free on various cloud storage services; for £6 a month you can get 1TB of OneDrive storage – along with the whole Office 2016 suite. That's why Box and Dropbox are trying to turn themselves into business services rather than sticking with the consumer market. Lots of cloud storage services have had the ambition to be everyone's online file system, but you need to have deep pockets and plenty of services that can plug in to store and access files. OneDrive (and the OneDrive for Business service that now uses the same technology) isn't Microsoft's only data storage option. Azure has a wide range of storage services for businesses, especially those with very large amounts of data that they need to archive and analyse; that's what the new Azure Data Warehouse and Data Lake services are for. Think of those more as giant databases in the cloud, whereas OneDrive is more like a giant hard drive, for much less specialised uses. For starters, Microsoft encourages you to save files onto OneDrive, and makes it easy to share them. The OneDrive client in Windows offers the same option to sync specific folders as on the Mac, but like Windows 8.1, Windows 10 uses OneDrive for much more than just cloud storage – although that's more useful because when you search for files, Cortana searches OneDrive and OneDrive for Business. You can choose to save documents and pictures straight to OneDrive by default, instead of putting them on your PC. If you use a Microsoft account to sign in to Windows, your settings are synced through OneDrive to any other PC you use that account with. Wi-Fi passwords you've saved, the colours you've chosen for the Start menu, your custom spelling dictionary and lots of useful info will automatically turn up on other machines. Several of the standard apps – Photos, Videos, Groove Music, Maps, Mail, Calendar and People – use OneDrive to sync information. In Windows 8.1, IE uses OneDrive to sync your favourites, history and even what tabs you have open, so you can easily carry on browsing when you change devices; that feature isn't in Edge but it's coming. Windows Phone saves backups of your system settings to OneDrive so you can make a new phone look just like your previous device. It also automatically saves photos and Office documents onto OneDrive, and the OneDrive clients for iOS and Android have that option too (and you can set OneDrive to automatically upload photos and videos from any phone or camera you plug in to your PC). The OneDrive clients on iOS and Android keep adding extra features – you can draw on, annotate and sign PDFs saved on OneDrive straight from the iOS app. Use the Office Lens app to take a photo of a document or a whiteboard and you can save that straight to OneDrive from your phone. Images you upload get tagged automatically using Microsoft's image recognition, but you can now add and remove tags yourself. 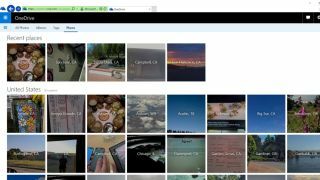 The sharing tools in the OneDrive website are better designed for sharing individual images, but as the album and tagging features improve and Microsoft does deals with more sites like Shutterfly for printing photos and personalising gifts with your images, OneDrive could grow into a popular photo site. Save music files in OneNote and you can stream them with the Groove Music app on Windows 10, Windows Phone, Xbox, iOS, Android or in a browser on other systems (like OS X). Office relies so much on OneDrive that Office 365 includes 1TB of OneDrive storage (or OneDrive for Business for the business and enterprise plans). Documents you save to OneDrive show up on the recent files list on all your PCs and some (though not all) of your Office settings automatically sync through OneDrive. The iOS, Android, Windows Phone and Windows 10 Mobile Office apps all let you save files straight to OneDrive and OneDrive for Business. In Outlook 2016 and Outlook.com, the file you're sending as an attachment is saved on OneDrive, and your email incudes a link rather than a copy of the file – or you can share straight from the program with the Share pane. In PowerPoint and Excel, documents saved on OneDrive can be edited by several people at once; in Word 2016, you can even see what they're typing live. The free versions of OneNote don't let you save notebooks anywhere but OneDrive – that would be the natural place for Wunderlist to-dos to end up as well. The new Sway app can open images and documents from OneDrive, and the Sway file itself is saved on OneDrive too. The Power BI service can open Excel files from OneDrive and OneDrive for Business, to make it easy to get your information into the service. Microsoft also has APIs to get third-party software working with OneDrive. There are plenty of Windows Phone and Windows Store apps that build in OneDrive integration, from HandyScan to most of the eBook apps, as well as iOS and Android apps, and even hardware. You can send faxes directly from OneDrive with Hello Fax, save notes from PhatPad, edit images with PicMonkey, scan documents with a NeatConnect scanner, search OneDrive with Found and track business documents with PandaDoc. You can also create IFTTT recipes for both OneDrive and OneDrive for Business. There are about a thousand recipes already, to do things like save photos you post to Facebook, Tumblr, Pinterest or Instagram, music you like on SoundCloud, or files from Flickr, Dropbox, Gmail, Pocket or an EyeFi Wi-Fi SD card to OneDrive. Connecting OneDrive to IFTTT comes the closest so far to making OneDrive a universal place to put your stuff online. Until very recently, OneDrive for Business was actually the old Groove sync tool and SharePoint combined in a new interface. Now it uses the same technology as OneDrive but adds extra features like encryption and data leak protection. It integrates with more of Microsoft's business services like Delve, Dynamics CRM and Skype for Business, plus there are other business tools that work with it, from Microsoft's own Matter Center, a specialty legal document management tool, to Moodle, a major educational content management system.